A fruit with over 7,500 varieties, apples actually originated in Asia, but you wouldn’t know it today as they are some of the most widely cultivated fruits in the world. But whether you like the tart Granny Smiths, the sweet Red Delicious, or the juicy Gala—these apples are providing you with numerous benefits you didn’t even know about, including cancer prevention. Several studies in the past several years have linked these crunchy fruits to a lower risk of cancer and even cancer cell death. According to researchers with Finland’s National Public Health Institute, people who consume the most apples are the least likely to develop cancer. They followed nearly 10,000 cancer-free subjects for several decades and found that those who eat the greatest number of flavonoid-rich foods (including apples) had a 20% reduced risk of developing cancer. Lung cancer risk was a whopping 46% lower than in those who are little to no flavonoid rich foods. Flavonoids aren’t the only beneficial compounds in these fruits, however. Oligosaccharides are a form of complex carbohydrates found within the fruit that are said to encourage cancer cell death. Chinese scientists found that oligosaccharides actually triggered apoptosis, or cell death. 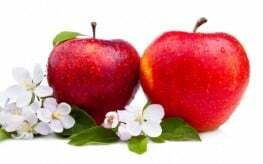 It’s how the body kills diseased cells naturally and apples assist in this process. In addition, the scientists found oligosaccharides may stop the forming of new cancer cells, suggesting apples and their derivatives could play a role in both cancer treatment and prevention. In the end, these compounds were found to kill up to 46% of human colon cancer cells and even outperformed chemo drugs. As if these studies didn’t offer evidence enough, researchers with Cornell University identified 12 different compounds in the peels of Red Delicious apples, each one responsible for inhibiting cancer cell growth or even killing the cancerous cells. Previous research from the same university found that apples can reduce the growth and number of breast cancer tumors. The bottom line here is that scientists have found several different mechanisms through which apples may help fight cancer. In order to reap these benefits, simply eat apples. “We believe that a recommendation that consumers eat five to twelve servings of a wide variety of fruits and vegetables daily is appropriate to reduce the risks of chronic diseases, including cancer, and to meet nutrient requirements for optimum health,” said Rui Hai Liu, associate professor of food science with Cornell University. An apple a day keeps the doctor away? Or, what appears to be more accurate: An apple peel a day might help keep cancer at bay. Apples are the second most common fruit consumed in the US (bananas are the first). The peel of the apple contains a third or more of its phytochemicals. Most of the quercetin and triterpenoids are found in the peel. But don't give up on the flesh of the apple. Although it's the 'white' part that gives it a bad name, the middle of an apple has a good amount of the fiber, pectin. Your GI tract uses the pectin to produce compounds that protect colon cells. This is particularly important because your GI tract is in charge of making sure that the right compounds are transferred from into your blood. You want to keep it healthy! wow…so rumors are true…an apple a day keeps the doctor and now the oncologist away… great article this is. Thank you!!! I appreciate you taking the time to write and share this!! I use a white vinegar and baking soda mixture to clean the applies I can't find in organic. And If you don't buy them organic,I would suggest peeling them or washing them thoroughly first. Can the seeds be swallowed intact, or do they need to be bitten into? If the former, won't they simply pass through the digestive tract? I am going to assume that these apples were not organic. This surprises me because apples are on the "dirty" list due to pesticides, which are believed to be linked with cancer? Not to mention all-natural cancer cure laetrile (aka vitamin B17) that is found in the apple seeds. Eat the entire apple, INCLUDING THE SEEDS!